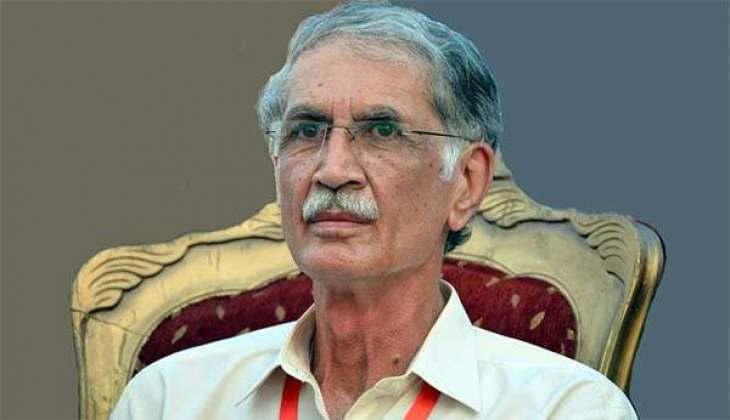 PESHAWAR: Khyber Pakhtunkhwa (KP) Chief Minister (CM) Pervaiz Khattak on Monday, in a rather unceremonious response to Jamaat-e-Islami (JI) Chief Siraj-ul-Haq’s recent statements on the Senate elections and KP’s provincial chief executive, said that he only takes orders from Imran Khan and nobody else. The JI chief had alleged that the Pakistan Tehreek-e-Insaaf (PTI) was ‘taking orders from the top’ to vote for Sanjrani in the Senate elections. Earlier, the JI chief had disclosed that Khattak had confided in him that a candidate from Balochistan has to be voted to be elected to the post of Senate chairman. “I inquired the name of the candidate, but Pervez Khattak feigned ignorance and said he would convey the name once he is told about it. The name has been recommended from the top,” Siraj had claimed and added that he was bewildered about who ‘from the top’ referred to. Adding to the whole situation, the former premier on Monday said that the disclosures made by the JI chief should be contemplated on, besides adding that the PTI chief should first ask himself on whose orders he voted for PPP candidates. Nawaz also said that the PTI chief should explain how Chaudhry Sarwar won a Senate seat from Punjab when the party lacked the required number of legislators in the particular provincial assembly in the first place. PTI spokesperson Fawad Chaudhry while coming to his party’s defence replied to the PML-N supremo by asking him to identify those who voted for former Punjab governor Chaudhry Muhammad Sarwar in the Senate elections. “Votes and those who voted for the PTI senator are evident to everyone,” he said. Commenting on the JI chief’s allegations, Fawad said that it is crucial to see whose agenda the JI chief is pursuing and whom he wishes to defame.